Let me be the first to say, it is really hard to open up the HG630B without breaking anything. You have to get the foot off first, this can be done with a small flathead screwdriver and a lot of patience. Once this is done, there are four screws to undo and a myriad of plastic clips holding the front and back together. You need to be careful of the antenna as it is partially attached to the case – It’s held in place by some slots inside the case. The rear of the board appears to have five pads in a row (upper right edge) which could be a serial/UART while the front of the board has a square pattern of pads (upper right edge) which could be a JTAG interface. I’ll have to do some sniffing around these pads to see what they are. 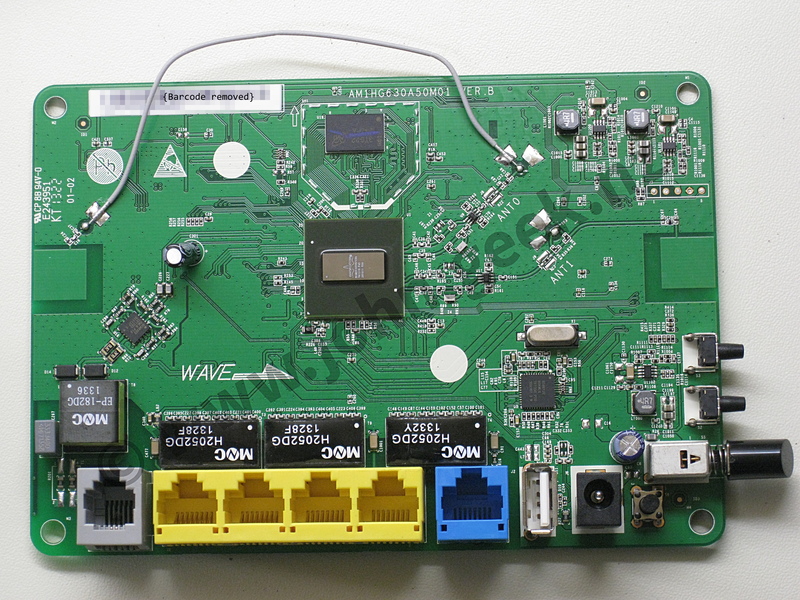 Hi, I would like to use your board images in the OpenWrt wiki. Please let me know if you agree. I want to show the differences across H630 board models. I just opened my HG630b, but I only saw 2 screws and did not have to detach the foot. Perhaps I have a different version of the case.